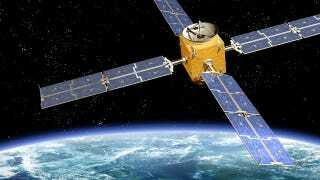 Are satellite orbits being compromised by global warming? As bizarre as this might sound, a new study published in Nature Geoscience is suggesting that global warming is having an impact on objects orbiting around the Earth. According to environmental physicist Stefan Noël, rising carbon dioxide levels are reducing the pull of the Earth's atmosphere on objects like satellites and space debris. If true, the impacts of climate change are considerably more far reaching than could have ever been expected. As a greenhouse gas, CO2 is typically thought of as something that contributes to warming trends. At the highest reaches of the atmosphere, however, this gas has a cooling effect. And it's this particular phenomenon that may be responsible for the atmosphere's reduced influence on objects in orbit around the Earth. The main effects of carbon dioxide up there come from its collisions with oxygen atoms. These impacts excite carbon dioxide molecules, making them radiate heat. The density of carbon dioxide is too thin above altitudes of about 30 miles (50 kilometers) for the molecules to recapture this heat, which means it mostly escapes to space, chilling the outermost atmosphere. Cooling the upper atmosphere causes it to contract, exerting less drag on satellites. Atmospheric drag can have catastrophic effects on items in space — for instance, greater-than-expected solar activity heated the outer atmosphere, increasing drag on Skylab, the first U.S. space station, causing it to crash back to Earth. Noël and his colleagues were able to measure the surge of CO2 in the upper atmosphere by using the Atmospheric Chemistry Experiment Fourier Transform Spectrometer onboard the Canadian SCISAT-1 satellite. By analyzing eight years worth of data, the scientists confirmed that, at an elevation of 60 miles (96 km), the mixture of carbon dioxide and carbon monoxide (what is a residual trace of CO2 following exposure to ultraviolet rays) is increasing at a rate of 23.5 parts per million per decade. What this means is that the upper atmosphere's composition is changing far more rapidly and dramatically than previously assumed. In fact, the CO2 levels are increasing at a rate of 10 ppm per decade faster than the models have indicated. And it's this escalated level of CO2 that the researchers theorize is responsible for the reduction in atmospheric drag experienced by satellites and space debris. The study can be found at Nature Geoscience.